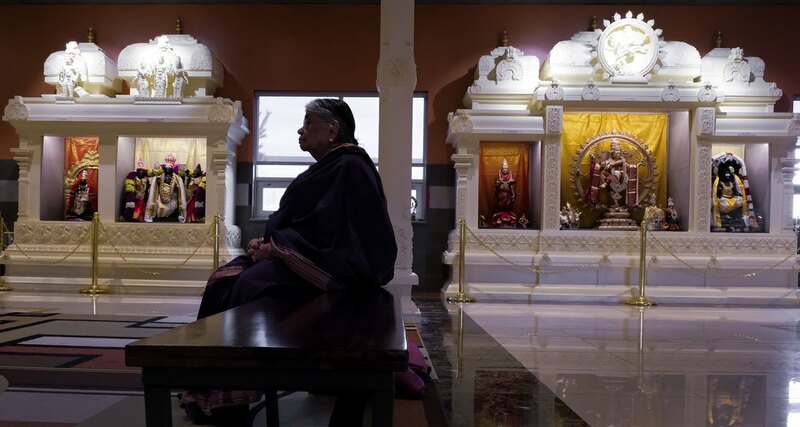 UTAH, USA, April 2, 2019 (Salt Lake Tribune, by Peggy Fletcher Stack): In a land of fast food restaurants, strip malls and car washes, the new tower of the Sri Ganesha Hindu Temple suggests a world apart. The gleaming tiers of the 34-foot spire, bedecked with sculpted figures and gold cones, hint at what will greet visitors inside the nondescript gray, cinder block building — a kind of heavenly city. Painted deities dressed in embroidered robes and silk tunics line three sides of the sanctuary, sitting under hand-carved sculptures that tell the stories of the Gods’ incarnations. For Utah Hindus, it finally feels like home — even for those who have never lived in South Asia but have nostalgia for the sights and smells of their ancestral abode. “Once you enter inside to see the shrines adorned,” says temple President Satish Nachaegari, “it connects you to most temples in India.” Devotees have enjoyed the temple since it was first consecrated in 2003 as a relatively small gathering space with the signature Ganesha statue, but the multifaceted individual shrines, iconography and tower did not fully take shape until after 2015, when it was rededicated. With the help of seven specially trained artisans, an Indian ambience emerged before their eyes. This enlarged and richly decorated space “fills a gap for our people,” says Venka Subramanyan, who oversaw the beautification process, “not just immigrants but those who have been here a long time.” Gliding quietly on the heated marble tiles or meditating in front of one of the shrines, worshippers in the growing community find a sense of joy. Many visit daily; others come weekly or on major holidays. They come for blessings before a test, before a big game, before a new project or performance, before a birth or marriage. ← Navreh 2017: How Kashmiri Pandits welcome New Year!